Proprietary technology with a high probability of generating novel, clinical products. Provides individual immune profiles or signatures that can inform diagnosis and therapies. Identify novel antigens as diagnostic markers and/or drug targets and human antibodies as therapeutics or aids in discovering vaccine candidates. 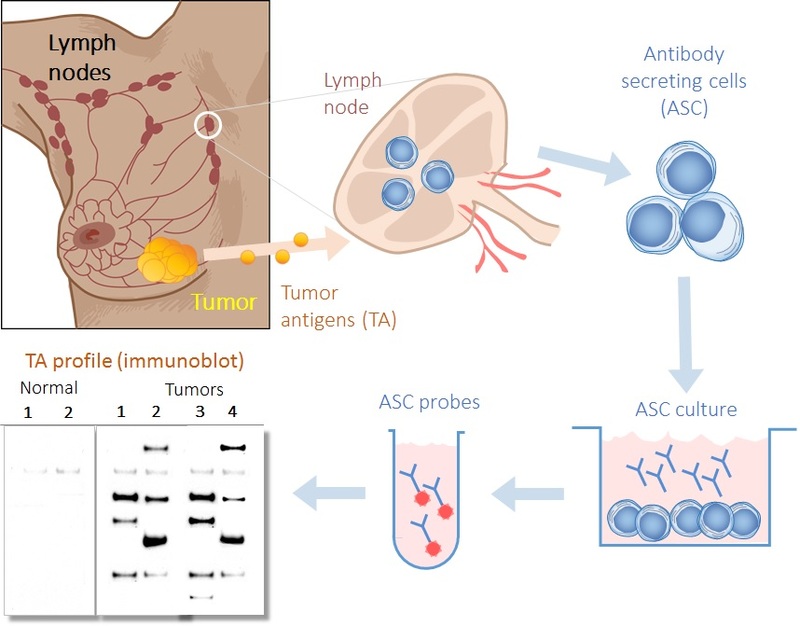 Diagnostic and therapeutic antibody discoveries with higher specificity due to their isolation from draining lymph nodes rather than serum. Compatible with other platforms such as 2D western blotting and proteomic analysis, expression and phage display library screening, glycan and peptide array screening. Also compatible with Glycan and peptide array screening, Antibody selection and expression systems. Immune profiles of breast and ovarian cancers. © Copyright 2017 - CancerProbe Pty Ltd. Website by JIVE Marketing.